A memorial continues to grow for three siblings who were run down and killed by carjackers while they were helping their mother sell fruit along a North Philadelphia street. Their mother, another woman and the carjacking victim are fighting for their lives as police search for the men responsible. "I'm gonna miss all three of them," said Ronnie, a neighbor of the victims. "They were very good, respectable children." The five pedestrians were working at the fruit cart on the corner of Germantown and Allegheny Avenues around 11:15 a.m. on Friday when a white Toyota 4Runner, stolen minutes earlier by two men, blew a tire and jumped the curb, Philadelphia Police Homicide Capt. James Clark said. 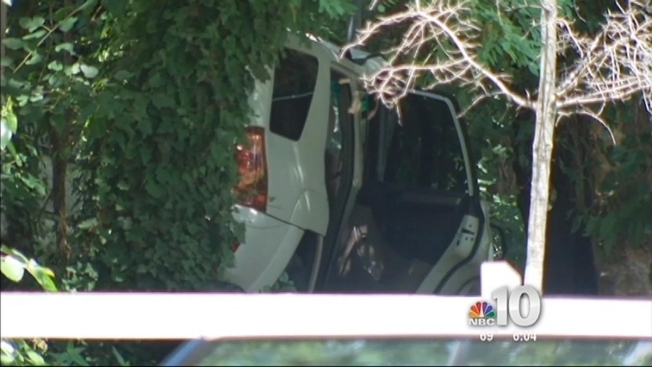 The large SUV plowed into the group, skidded across a grassy lot and rammed head-on into a tree. Thomas Reed, 10, drew his last breath on the street, Clark said. His 15-year-old sister Keiearra Williams was taken to Temple University Hospital where she died a short time later. Their 7-year-old brother, Terrence Moore, was rushed to St. Christopher's Hospital for Children where, despite doctor's efforts, he died. "That's my son ya'll took away from me," said Terrence's father. "Whoever you all are, turn yourselves in!" Officials said the children were helping their mother sell the fruit to raise money for their church. "I've been in the homicide unit for six years and this is one of the saddest cases I've come across," Clark said. "You have three innocent children who had the rest of their lives in front of them that were taken in this fashion. It's very sad. It's very tragic and we will find the individuals that are responsible." Keisha Williams, the children's 34-year-old mother, and 69-year-old family friend Thelma Brown were also seriously hurt. Clark said the mother is in extremely critical condition at Temple University Hospital. A sixth victim, the woman who was carjacked, is also in critical, but stable condition at Temple. She was in the SUV when it crashed. Clark said she is a real estate agent and had just finished showing a home near 6th and Cumberland Streets when the men forced their way into her SUV at gunpoint. That's about a mile from the crash scene. At first, the suspects had the real estate agent drive, but then forced her into the back seat as one of the men took the wheel, Clark said. Detectives believe the SUV was traveling at a very high rate of speed when the tire blew. The white Toyota 4Runner careened across a grassy area and slammed into a tree. Both suspects fled the scene on foot after the crash. A manhunt is now underway. The suspect's descriptions are not fully clear, but one was wearing a white T-shirt and basketball shorts. Police say he was armed with a gun. The other suspect is wearing an orange shirt and basketball shorts. Authorities say the men may be injured from the crash and they have alerted all area emergency rooms to be on the lookout for anyone who comes in with car crash injuries. Homicide detectives have also obtained some surveillance video from both scenes and plan to look for any identifying photos of the suspects. The city is offering a $100,000 reward to anyone who provides information that leads to an arrest and conviction of the men. The reward had begun at $20,000, but continued to rise as each child passed away and additional donors chipped in. The Fraternal Order of Police added an additional $10,000 to the reward for the arrests of the men wanted in the fatal accident. To receive the $10,000, the men must be in police custody by noon Monday. "There are really no words for how I feel right now, but we do need to find these people and that needs to be our focus right now," said Philadelphia Police Commissioner Charles Ramsey. "Finding the people responsible for this crime and get them in custody as soon as possible before they harm anyone else."